CAUTION: USE ONLY ON CARPET. DO NOT USE THIS PRODUCT ON ANY HARD FLOORS, HARDWOOD FLOOR AND SO ON! US STOCK, FASTER DELIVERY BY USPS, FEDEX AND UPS WITH FREE TRACKING NUMBER. 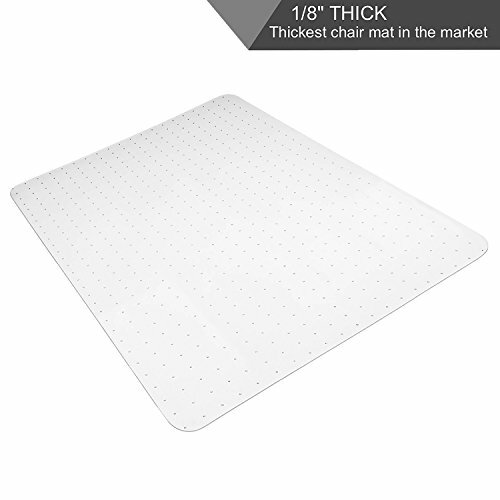 Matladin Chair Mat: Shipped flat, transparent, much thicker 1/8 inch, crack-resistant, curl-resistant, anti-slip, no-odor, non-recycle material, easy clean, family friendly, no-toxins, no-cadmium, no-tin and no-lead and durable and long lifespan. Are you looking for a chair mat features all above merits to provide the ultimate carpet protection for your office or home? This Matladin chair mat is the best choice for you to protect carpet tiles, low pile carpets, standard pile carpets and medium pile carpets. Matladin chair mats are ergonomically designed for glide smoothly with ease, reducing leg fatigue and eliminating the strain off your back and legs. Buy it right now with confidence! Brand: Matladin endeavors to become a professional mat seller who pursues the quality and service. We supply rectangular and lipped style carpet chair mat. We also supply chair mats with lip for carpet tiles, plush pile carpets and hard floors. If you have any issue on our products, please do not hesitate to contact us and we will try our best to solve your problems. UPGRADED 1/8" THICK & ODORLESS: This Matladin carpet protector is much thicker than other chair mats, 1/8 inch enhanced thickness to achieve no dip, crack-resistant, curl-resistant and durable. Chair mat for carpet features NO-odor, NO-toxins, NO-cadmium, NO-Tin and NO-Lead. HIGHLY TRANSPARENT & NON-RECYCLE MATERIA: Carpet protector is made of 100% pure PVC, ECO, healthy, non-recycle material, which makes carpet floor mat durable, highly clear, show through from the surface and maintain the aesthetic of your home or office carpet visible while it is protected. BETTER GRIP STUDDED BACK & ANTI-SLIP: Studded back design provides better grip ability to keep chair mat in place firmly, no slip and prevent damage to your low, standard and medium pile carpet due to the rolling of office chair. HIGH IMPACT STRENGTH FOR GLIDING WITH EASE: This Rolling chair mat for carpet features superb impact strength and hardness enable office chair roll smoothly with ease on it, which help reduce leg fatigue. This chair mat for carpet tiles features easier clean. SHIPPED FLAT & CRACK- RESISTANT & CURL-RESISTANT: This 48" x 36" flooring mat for office desk chair is shipped flat so as to avoid curling and taking effort to lay it flat. Crack-resistant, curl-resistant chair mat for carpet aims to provide the ultimate protection to low, standard and medium pile carpets. If you have any questions about this product by Matladin, contact us by completing and submitting the form below. If you are looking for a specif part number, please include it with your message.